There are several ways to use the winter break to prepare for the second half of the season. But while Les Lyonnais decided to stay at home and brave the cold and the snow, the Alsace outfit, Racing Club de Strasbourg, preferred Tunisia. 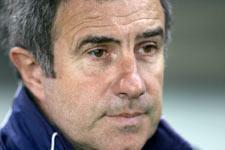 It was in Sousse that Jacky Duguépéroux chose to set-up camp over the winter break in order to best prepare their various campaigns. The toughest battle facing the side will the fight for their Ligue 1 survival; the UEFA Cup has provided something of a bonus, as could te Coupe de France. So where exactly are Strasbourg after five months of competition? Qualified for the UEFA Cup following their Coupe de la Ligue win over Caen last season, Strasbourg have overcome their various tests in flying colours:6 matches without defeat with four wins and two draws (14 goals scored, 3 against). Qualified for the round-of-32 against Bulgarian side Litex Lovetch, Strasbourg could conceivably play Monaco or Basel in the last 16. It’s a surprising record when one considers the clubs L1 record after 19 matches! In the Coupe de la Ligue they didn’t hang around long: eliminated in the first round by Caen, 1-0. However the side’s biggest worry remains the league. In the first half of the season the Alsacians have 11 points (1 victory, 8 draws and 10 losses; 10 buts scored and 22 conceded). Those statistics have the teammates of Guillaume Lacour sitting last, two points from Ajaccio, three behind Metz and already ten from Sochaux, the first team out of the relegation zone. There’s no need to draw a picture: all is not well in the club that is nearly 100 years old. Stricken with bad luck, the side’s loyal supporters are still awaiting the first win of the season at Le Meinau. The home record doesn’t make for pretty reading with five draws (Auxerre 0-0, Bordeaux 0-0, Lens 1-1, Nice 0-0, Sochaux 0-0) and five defeats (Monaco 2-1, Toulouse 4-2, Rennes 1-0, ASSE 1-0, OM 1-0); four goals scored, ten conceded. In seven of those ten home games Pagis and co. were unable to register a single goal. They haven’t scored in their last five home games. The side has also drawn its last six games, home and away. 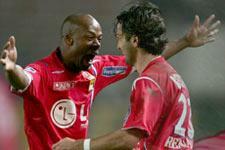 10 goals scored in all (Pagis 4, Haggui 2, Diané 2, Le Pen 1 and A. Farnerud 1); One from a free-kick (Monaco); 9 in the penalty box; 2 penalties (Pagis against Nancy and Nantes); 4 headers; 3 goals from crosses; 2 two from free-kicks; 1 from a corner. 22 goals conceded of which 4 were from outside the penalty area; 3 headers; 6 from crosses; 2 from corners; 1 from a free-kick. [IMG39592#R]Jacky Duguépéroux has used 26 players. 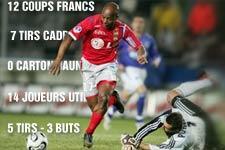 Only Guillaume Lacour has played in all 19 league games and he has started each one. He has only missed 19 minutes out of a possible 1,710. Nicolas Puydebois took over from Stéphane Cassard in goal following the defeat to Lille. The former Sochaux, Le Havre, Montpellier and Troyes ‘keeper was finally sanctioned for three blunders which resulted in goals (Rennes, Le Mans and Lille). “Nico” is now first choice in goal. The Strasbourg coach will also have to deal with a number of absences through injurry, such as Keita, Haggui, Le Pen… Bassila quit the club at the start of the season after being abused by the Meinau public. As for Mouloungui he has been loaned out to Gueugnon. In the disciplinary department they have received 31 yellow cards and five reds. Boka is leading the way with five yellows and a red. Survival already looks doubtful although mathematically, anything is still possible. But the figures speak fr themselves. In the last three campaigns clubs have needed 43 and 39 points (twice) to survive the drop. Istres, last year’s bottom club had 12 points at the halfway mark (one more than Strasbourg!) and were relegated witha total of 32 points. There’s plenty of work to do and it starts... against OL!